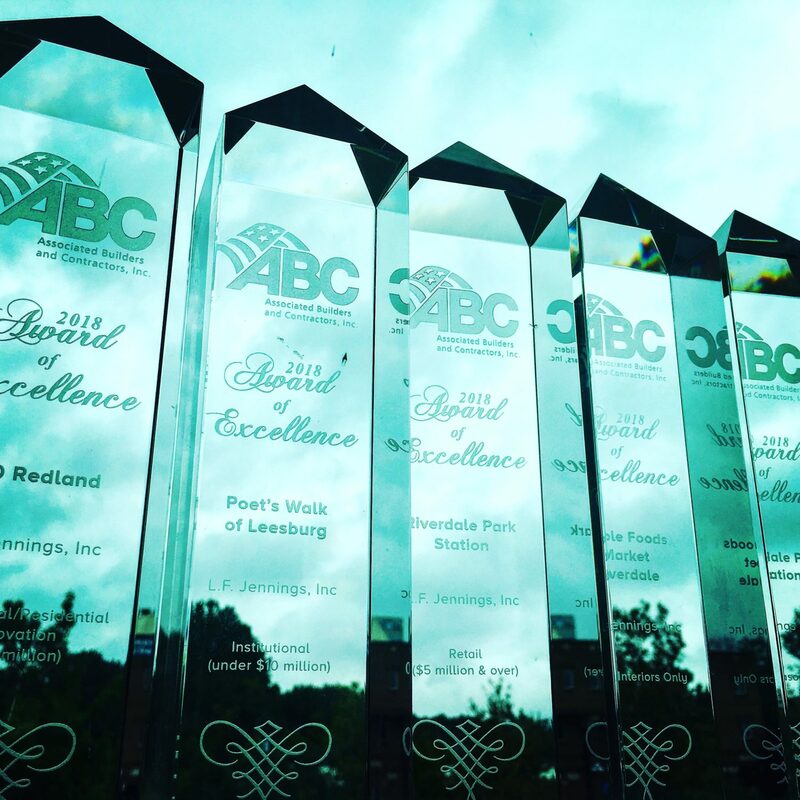 L.F. Jennings is the proud recipient of five Associated Builders and Contractors of Metro Washington Excellence in Construction Awards for Poet’s Walk of Leesburg, 540 Redlands Building Repositioning, Whole Foods Market Riverdale, and awards for Retail development and Masonry at Riverdale Park Station. Poet’s Walk of Leesburg is a Spring Hill Senior Community member that specializes in a personalized approach to memory care assisted living. The single story, 38,000 SF building accommodates 68 residents. The facility is designed and constructed to give occupants a high-end experience. Dining facilities, a bistro, community areas, an ice cream parlor, a salon, and two enclosed courtyards all work to sustaining the community resort atmosphere, while discrete nurse call stations and building security provide support and safety for the residents. Poet’s Walk of Leesburg was awarded an Excellence in Construction Award in the Institutional (Under $10 Million) category. Congratulations to Silver Companies and LRS Architects. 540 Redlands is a building repositioning that included upgrades to the lobby, glass storefront, lighting, elevator cabs, conference center and the introduction of a new fitness center and interactive lounge with gas fire place. Most dramatic change to the building was the reorientation of the entrance. L.F. Jennings sealed the existing entrances to the building and cut a new central vestibule in the existing feature curtain wall. This new entrance provided the building with a more prominent presence within the corporate development improving the sense of place of the central plaza and circulation to office building. 540 Redlands was awarded and Excellence in Construction Award in the Commercial/Residential Renovation ($2-$4 Million) category. Congratulations to DCS Design and Charlie Smiroldo formerly of First Potomac. Riverdale Park Station is the transformation of a 38-acre site that once was a WWII workforce housing tract into a dynamic, mixed-use project. Organized around stretches of green space, open plazas, and significant pedestrian and bike activities, Riverdale Park Station creates a balanced mixed-use town center for its residential, retail, office and hotel buildings. Phase I of this development consists of a150,000 SF Whole Foods Market anchored retail development, site amenities, and both surface and structured parking. Phase One also included extensive site work for parking and public amenities like splash park, benches, and art installations. Riverdale Park Station was awarded Excellence in Construction Awards in the Retail ($5Million & Over) and Masonry categories. Congratulations to Cafritz Enterprises and MV+A Architects, and L.F. Jennings Masonry. Whole Foods Market Riverdale is the anchor tenant of Phase One of the Riverdale Park Station mixed use development. The industrial style 36,000 SF store interior is a destination grocery store featuring coffee bar, New York and Chicago style pizzeria, full deli, and sushi bar. The Whole Foods is Prince George’s County’s first and the catalyst to that development’s success. Whole Foods Riverdale was awarded an Excellence in Construction Award in the Retail/Interiors Only category. Congratulations to Whole Foods Market and MV+A Architects. L.F. Jennings would also like to thank all our subcontractor partners on helping us deliver award winning projects for our Clients.